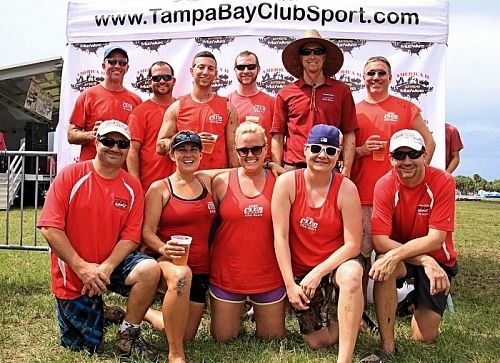 Tampa Bay Club Sport (TBCS) was formed created in 1995 as an outlet for young-minded adults to enjoy social sports. From sport leagues to parties and happy hours to special sporting events, over 30,000 active young professionals a year can do it all with TBCS. Since then Club Sport has been Tampa Bay's largest provider of social sports leagues. We are here to make sure you get involved, stay active, and meet new people. It is a great way to get out, get social, meet new people & have fun in a friendly atmosphere. Visit our FAQ page for answers to all your Club Sport questions! We'll see you out on the field. Club Sport leagues can also be found in the Sarasota (SoCo Club Sport) as well as Miami and Ft. Lauderdale (South Florida Club Sport). In addition, we offer youth sports (Club Sport Kids), corporate events (Club Sport Corporate Events), and traveling soccer tournaments (Soccer Six Florida). Check out more on all these great companies at www.MyClubSport.com!